For unclear reasons, for several years this was my most popular post on this blog. Because of this, I recently updated it to reflect both changes in my posting style and substantial improvements in available data. 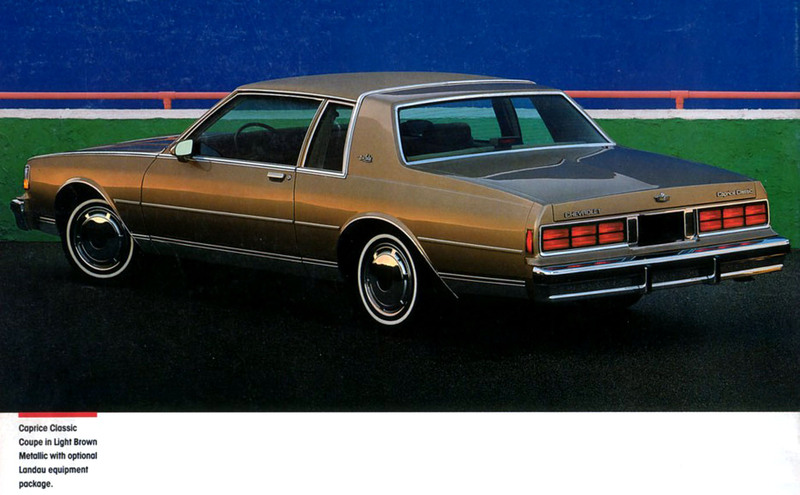 1987 was the final model year for Chevrolet’s Caprice Classic coupe, with only 3,110 made. Beginning in 1988, the Caprice would soldier on with just the sedan and wagon, as the once very popular big American coupes continued to lose favor. The standard power team on the coupe (and sedan) was the LB4 140 bhp 4.3 liter/262 ci V6 with throttle-body fuel injection paired with a three-speed automatic transmission. Mileage was rated at 18 city/23 highway by the standards of the day (16/22 by modern standards). Optional power was the LG4 165 bhp 5.0 liter/305 ci V8 with four-barrel carburetor paired with a four-speed automatic transmission (I see what you did there, Chevrolet). In 1987, this combination was rated at 18 city/25 highway (16/23 by 2014 standards). With a 25-gallon fuel tank, you could reasonably expect a comfortable range of about 440 to 480 miles with a 10% fuel reserve—impressive for a 3,600-pound full-size car back then. Even with the V8, these cars were not fast—0-60 came in about 10.5 seconds. Standard equipment for the $11,392 coupe (about $26,000 in today’s dollars—just a few thousand dollars less than a 2019 Impala LS sedan goes for) included power steering, power brakes, halogen headlights, and P205/75-R15 all-season radial tires (a size still readily available) on 15-inch wheels. Inside, a full-width cloth bench seat, Quiet Sound Group, and an AM radio were standard. Optional equipment included air conditioning ($775), cruise control ($175), power door locks ($145), power windows ($210), power seats ($240 each), power trunk opener ($50), a 50/50 split-front seat ($195), and AM/FM stereo cassette with graphic equalizer ($435). Caprice Classic Coupe pages from the 1987 Chevrolet Impala/Caprice brochure, linked from the Old Car Manual Project’s amazing brochures section. These big and (I think) handsome coupes show up occasionally in the Hemmings Motor News classifieds and on eBay Motors, though Hagerty’s valuation tools do not track Caprice Classic values past 1975. When I updated this blog entry in August 2017, there was a Light Brown Metallic/Medium Brown Metallic two-tone 1985 coupe with saddle velour seats and 60,000 miles for sale on eBay Motors with a starting bid of $8,500. Make mine Silver Metallic, please, though I’m tempted by the Black/Medium Gray Metallic two-tone. Another Caprice that I’ve written about is the 1985 Caprice Classic station wagon.